Dominoes are a descendent of dice, and dice can be played in any number of interesting and challenging games, including Bunco, Shut-The-Box, Yahtzee, and many more. Dice, in various forms, have been played by humans for millenia. Ancient dice have been found in Egyptian tombs, Chinese burial chambers, and in remains from civilizations around the world. Dice are simple and elegant gaming implements, available in a wide variety of sizes and colors, and made from a large assortment of materials. They're inexpensive, extremely portable, and familiar to almost everyone. Six-sided cubes are currently the most common form, but dice of other shapes and number of sides are also available. 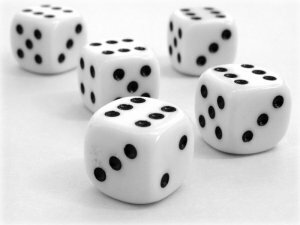 Dice are the main piece of equipment in a number of family games, as well as gambling games such as Craps. In addition, dice are used in numerous board games such as Backgammon, Pachisi, Monopoly, and many more, bringing a necessary element of chance to gameplay. Board Game Central - Learn about and buy dice games, including Yahtzee, Farkel, Kismet, Stack, and more. Board Game Central is the web's premier site for traditional & family board games. Dice Games Directory - The open directory project offers nearly a hundred links to dice game sites. International Bone-Rollers Guild - Dice and gaming. Includes information on the history of dice, different types of dice available, links to relevant sites for each category, and rules listings for almost every known dice game, as well as lists of commercial suppliers of dice and custom dice manufacturers. The Game Cabinet - Dice are credited by several historians as the oldest gambling device invented by man. I would like to take some time to give the humble cube another, more detailed, look. This is not so much an article as a collction of interesting facts.